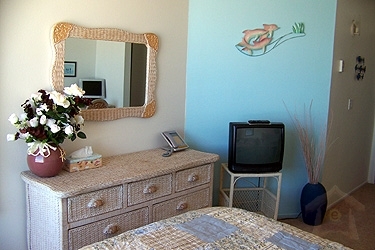 This is a charming 2 bedroom ocean front condominium located in lovely Mission Beach, San Diego, California. 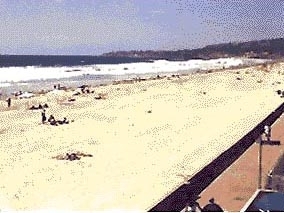 The condo is located on a 2 block wide spit that separates the ocean beach from Mission Bay. The unit is pleasantly and newly furnished in a classic contemporary style. It was developed with the ocean in mind. You have stunning views from all the main living areas. And the master bedroom faces the ocean, presenting a large window ocean view. There are cable TV's, VCR's and a music system, as well as some CD's, tapes, games, puzzles, and books. The kitchen has all you require for cooking a fabulous meal to baking a pie. Serving for 8 is provided along with lots of sizes of pots and pans, storage bins, utensils, etc. One thing is for sure, if you are planning to cook, you can't do without the big things or the little things! And all this is still only 5 minutes from Sea World, and few minutes from the airport, downtown, the zoo, La Jolla, and many other attractions. Whether on a business trip or a vacation, you will never stay in a motel or hotel room again after staying here. You will find your experience away from home far more pleasing and satisfying at this condo. The unit is available year-round and is very fairly priced. We desired everyone. Deposits: My property manager requires a deposit when you arrive at the unit. Your credit card is swiped but not charged at that time. The deposit amount is $200.00. Otherwise, there is no other down payment. Cancellation Policy: Cancellation of any nightly or weekly reservations prior to 90 days of arrival will be refunded your deposit, less the reservation fee and a $100 cancellation charge. A reservation cancelled 61 days prior to arrival will be charged $300 and forfeit the reservation fee. Any reservation cancelled within the 60 days prior to arrival will forfeit the entire amount of the reservation. NO refunds for early departure. It is famous for its 100 year old amusment park, and its 3 miles of beautiful sandy beach. San Diego is known as the "Weather Capital of the World." It and its surrounds have mild temperatures all year. Visitors from overseas are discovering its attractiveness, as well as some Easterner's who have given up on Florida! Escape your heat or cold to visit Sunset Sands. The city is loaded with world class and world famous attractions for you to enjoy during your stay. 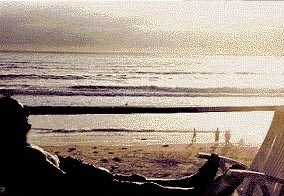 Or you can rest, relax, and recuperate here. It is the one place where you can do everything, or you can do nothing! Activities Walking and running (for miles all along the beach, boardwalk, and Mission Bay Park), swimming, surfing, boogie boarding, sun bathing, beach games, bay fishing, deep sea fishing, motor boating, sailing, water skiing, para-sailing, jet-skiing, kayaking, paddle-boating, scuba diving, snorkeling, tide pooling, whale watching (in winter), golf, volley ball, picnicking, hiking, people watching, shopping, restaurant hopping and exploring, club hopping and exploring, and much more� AND sightseeing and activities in San Diego: Sea World, Seaport Village, Old Town, Wineries, San Diego Zoo, Legoland, Balboa Park and museums, Cabrillo National Monument, Wild Animal Park, San Diego Padres baseball, San Diego Charges football, Gaslamp Quarter (downtown), Scripts Institute of Oceanography, Trolley, Coronado Island, Del Mar Race Track, Casinos, Carlsbad Flower fields, Tijuana, Mexico, Sweetwater Marsh, and much more! DIRECTIONS From the East - Coming into San Diego from the east. Get or stay on Interstate 8 West. Follow the signs that say "Beaches" all the way through the city. It will take 30-45 minutes to traverse the city. or From the North - Coming into San Diego from the north. Get or stay on Interstate 5. Exit onto Interstate 8 going west. Exit at Sports Arena Blvd. /West Mission Bay Drive. Stay in the right lane of the exit ramp and turn right at the light. This is West Mission Bay Blvd. You will immediately cross a bridge. About 1/4 to 1/2 mile or so past the end of the bridge you will turn right into an "exit" that is signed West Mission Bay Dr. again. Bear to the right after the bridge. You will need to get over about 2 lanes quickly to get to the exit. Follow the curving exit ramp and proceed on West Mission Bay Dr. for about 1 or 2 miles. You will cross 1 or 2 bridges over the bay and pass a couple of big hotels. When you get to a cross street called Mission Blvd. turn right. This road is hard to miss because of the big roller coaster of Belmont Park on the corner. Proceed up (north on) Mission Blvd. You will travel about a mile or so until you reach the intersection with a light at Santa Clara. Continue past the intersection and in a few blocks you will reach the first stop sign past the light. Turn left here onto the side street San Jose. Go about 50 feet until the first street (which is like an alley) called Strand Way. Turn left. Go slowly here, you are very close. Go ahead until you reach Redondo Court. Our building will be on the right from here to the next street sign, Queenstown. You are looking at the back of the building, but it has a 3755 number in the upper corners and center. Welcome to Sunset Sands! we also have a vraitey of board gam Edit PropertyProperty InfoProperty FeaturesRental RatesRental PoliciesLocation InfoEdit Photos We also have a variety of board games.. Barbecue BBQ Private Charcoal Barbecue Community Charcoal Barbecue Private BBQ Private Gas Barbecue Community BBQ Community Gas Barbecue Add More Features (separated by semicolon) e.g. Fishing;River Rafting Bathroom Bathtub Spa Bath/Jetted Tub Shower Alfresco Shower Hair Dryer Add More Features (separated by semicolon) e.g. Fishing;River Rafting Bedding Twin Bed Twin Trundle Bed Twin Futon Twin Sofa Sleeper Twin Murphy Bed Bunk Bed Bunk Bed with Twin on Top and Double on Bottom Double Bed Double Futon Double Sofa Sleeper Queen Bed Queen Murphy Bed Queen Waterbed King Bed Split King - Turns into 2 Twins California King Bed King Futon King Sofa Sleeper King Murphy Bed King Waterbed Child Size Bed Crib Day Bed Roll away Bed Sofa Sleeper Add More Features (separated by semicolon) e.g. Fishing;River Rafting Bedroom Extras Private Bathroom Walk-in Closet Add More Features (separated by semicolon) e.g. Fishing;River Rafting Boating Pier Marina Boats Available Boat Dock Private Boat Dock Boat Launch Add More Features (separated by semicolon) e.g. Fishing;River Rafting Child Friendly Babysitting Available Kids Club Playground Play Equipment Child Friendly Add More Features (separated by semicolon) e.g. Fishing;River Rafting Cooling Comfort Central Air Conditioning Ceiling Fans Air Conditioning Answering Machine Dining Room Dining Table Seats Formal Dining Room Dining Table Add More Features (separated by semicolon) e.g. Fishing;River Rafting Disability Access Features Disability Access Wheelchair Accessible Disabled Parking Elevator Ground Floor Unit Single Level - No Stairs Walk-in Shower Safety Bars in Shower Grab Bars in Bathroom Television Amplifier Closed-Caption TV Vibrating Alarm Visual Alarm Knock Lights Hydraulic Lift for Pool Add More Features (separated by semicolon) e.g. Fishing;River Rafting Entertainment TV TV/VCR TV/DVD TV/DVD/VCR Cable TV Satellite TV Big Screen TV Flat Screen TV DVD Player VCR Video Library DVD Library No DVD Player No VCR No TV Stereo CD Stereo Cassette Player CD Player Piano Wet Bar Telescope Television AM/FM Radio Fireplace Fireplace Gas Fireplace River Rock Gas Fireplace Wood Burning Fireplace Rock Fireplace Kiva Fireplace Wood Stove Gas Stove/Fireplace Add More Features (separated by semicolon) e.g. Fishing;River Rafting Games Pool Table Bumper Pool Table Video Games Ping Pong Table Foos Ball Dart Board Air Hockey Xbox Playstation Board Games Games Reading Library es.